Making authentic Bouillabaisse of Mme. Lulu Peyraud of the famous Domaine Tempier Winery, Le Plan du Castellet, South of France. Mme. 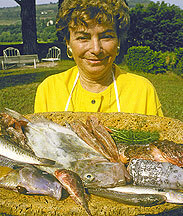 Lulu Peyraud with the still alive Poissons du Roche. Like the Ojai Marmalade, this recipe, or rather the demonstration of it is a story in itself, and to us, a very cherished one. Back in 1990, after having done a story on the fabulous wines of Domaine Tempier, a family run winery near Bandol on the coast of Provence in the south of France, we were talking to M. Lucien Peyraud, the owner and the wine maker, about where to find the best, most authentic Bouillabaisse. Naturally, he said his wife, Lulu, made the very best Bouillabaisse as it has been made in her family since the beginning of time or even before since it is a dish that was enjoyed by the God's long before we humans were even a glint in the eye and so on. So when Lulu invited us back a few weeks later for a demonstration and tasting (actually more of a full meal with family), we jumped at the chance. Linda was drawn into the act as chef's helper while I raced around trying to take pictures before the ingredients (most still flipping and gasping!) were already in the pot. Lulu worked without a recipe, knowing from her grandmother's knee exactly what to do and in what proportions. So after receiving instructions like "oh just a pinch of this and a soupçon of that" we gave up on trying to either keep up with her or write down a recipe. Instead, we are reproducing here, to accompany the photographs of Lulu at work. We recently received permission from Lulu to reproduce her recipe on our pages and here it is (below). This recipe might be a bit daunting to the first timer, but give yourself time but most especially do check the resource links to several sites that have information that can help you. Much to much to put on this site at this time. Lastly, there is a secret to adding the final touch to the Bouillabaisse that no one knows except the person you are talking to and he/she got it in a sealed envelope from their Grandmother at her death and on pain of torture, we were not to divulge the secret to anyone. But since everyone we talked to whispered it into our ears just after looking furtively around for possible spies, we feel that the secret must have leaked out long before we were privy to it. It is this - get closer and listen carefully. PASTIS! About a single shot will do the trick. Now don't tell anyone we told you. While this dish requires time to create, it is certainly well worth the effort. But to make it worthwile, plan on making it for 6-8 people. Lulu's Recipe for Bouillabaisse prepared by Richard Olney (reproduced here from Lulu's book "Lulu's Provençal Table" by Richard Olney and a forward by by Alice Waters. With permission by Lulu Peyraud). With the exception of the Anglerfish, all the fish in Lulu's bouillabaisse are whole. She counts 2.0 minutes from the time the potatoes and mussels are added. Because most of the filleted fish will require shorter cooking, I (Richard Olney) have adjusted the timing. Spread the pieces of fish out on a platter, distribute the fennel branches among them or sprinkle with the powdered fennel seed, sprinkle with saffron, add the fragmented crushed garlic, and dribble olive oil all over. Turn the fish around and over several times in its marinade, rubbing the surfaces gently until evenly yellowed with saffron and coated with oil. Marinate for a couple of hours, turning the fish over two or three times, while preparing the fish soup and the rouille. In a large heavy pot, warm the olive oil over medium-low heat, add the onion and the crushed, unpeeled garlic cloves, and stir regularly with a wooden spoon until the onion is softened but not colored. Add the tomatoes, the broken-up heads and carcasses, and the cut-up conger eel, raise the heat to medium, and stir regularly, mashing with the spoon or a wooden pestle, until the contents of the pot are reduced to a coarse debris. Add the live crabs and stir until they turn red. Pour over water to cover generously, stir to make certain nothing is sticking to the pot, bring the water to a boil over medium-high heat, and skim the foam from the surface. Add salt, pepper, fennel, leek, celery, and carrots. Adjust the heat to maintain a light boil, lid ajar, for 45 minutes. After 5 or 10 minutes, remove the crabs, one or two at a time, to a marble mortar. Pound them with a wooden pestle, breaking up the shells thoroughly, and spoon them back into the soup. Rinse out the mortar with a ladle of soup and pour it back into the pot. Remove the bouquet of fennel and pass the contents of the pot, a couple of ladles at a time, through a fine sieve into a large bowl, pressing with the wooden pestle to extract the liquid without passing any of the debris into the puree. Spoon the pressed debris from the sieve, discard it, and pour the sieved soup into another bowl before beginning again. "When all the soup has been passed, rinse the sieve, making certain that no tiny fish bones remain, and pass the soup again, loosely, shaking the sieve gently, to separate the broth from any pureed solids or fish bones that may have passed through the first time. Put the bread crumbs in a bowl and, with a fork, mash them with the dissolved saffron, adding a bit more fish soup, if necessary, to form a loose paste. In a mortar, pound the cayenne peppers to a powder with a wooden pestle. Add the coarse salt and the garlic, pound to a paste, add the anglerfish liver, and pound to a consistent thick smooth paste. Add the egg yolk and the saffron-bread paste and turn briskly with the pestle until the mixture is smooth and homogenous. Mount it like a mayonnaise, adding the oil in a thin trickle to the side of the mortar, while turning constantly with the pestle. Reheat the fish soup, dissolve the saffron in a ladle of boiling soup, and stir it in. Add the potatoes, onion, tomatoes, garlic, and fennel and return to a boil. Five minutes later, add the mussels, then the marinated pieces of anglerfish. Five minutes later, add the remaining fish and boil for 10 minutes longer (boiling produces a liaison between the broth and the olive oil}. 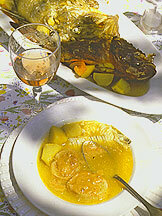 With a large, flat, slotted skimming spoon or a spider, lift the pieces of fish onto a large heated platter, the mussels and potatoes onto another platter (never mind if they get a bit mixed up), and ladle part of the broth into a heated soup tureen, leaving the remainder over heat for the second servings. At table, smear garlic crusts thickly with rouille, place a couple of crusts in each soup plate, and pour over a ladle of soup. In separate plates (or the same), serve potatoes, mussels, and fish; pass the rouille and the broth. Bouillabaisse was originally the fare of the local fishermen who on returning from a fishing expedition sorted heir catch: some to be sold on the local market, some to be kept to be eaten at home. It is therefore a simple family dish which has been improved and modified over the years to the point that today some bouillabaisse includes shellfish. There is no one recipe, rather there are family traditions passed down. Economics and taste through the ages have contributed to the recipes. At times, saffron and even pepper have been in short supply. So try this or the other recipes and find one or modify one that suites your taste and the ingredients that are available in your region. "First, you must find the rascasse (scorpion fish) or other member of the Scorpaenidae family. Scorpion fish are sometimes sold fresh in ethnic fish stores, but one is likely to find, at times, excellent rascasse substitutes in North Atlantic and Pacific Scorpaenidae such as blue- mouth, redfish (ocean perch), rockfish, and sculpin. Other excellent-tasting fish with similar flesh textures will also work well, fish such as wolffish (ocean catfish), striped bass, sea bass, red snapper, grouper, wreckfish, tautog (blackfish), and tilefish. Without getting into too much detail, one reason the rascasse tastes good is its diet among the rocks of the deep waters it inhabits. The taste of scorpion fish can be approximated by using a combination of redfish (ocean perch), the fish closest in taste, or wolffish (ocean catfish), grouper, red mullet or snapper, or dogfish (Cape shark) in a one-to-one ratio for the amount of rascasse called for." Also, the authentic Bouillabaisse is served in two parts; one is the broth in the bowl with the croutes and often with potatoes, then the fish itself is served on a platter from which you help yourself and add your choice of fish to the broth in your bowl. The choice of wine depends on your own tastes in wine as well as the power of the garlic and saffron you like to use in the dish. But a decent white or better yet, a good rosé are excellent choices. I am sure that if you can find a Domaine Tempier you will love it!